The iPhone Dev-Team has updated RedSn0w 0.9.15 with some bug fixes for iPhone 3GS and iPad owners. The iPhone Dev-Team released RedSn0w 0.9.14b2 with improved algorithm for baseband downgrade from the iPad's 06.15 baseband to 05.13 on the iPhone 3GS and iPhone 3G. The 06.15 baseband was used by many users to unlock their device. Now it is possible to to get back true GPS and an ultrasn0w unlock. You can download RedSn0w 0.9.14b2 here. The iPhone Dev-Team released RedSn0w 0.9.14b1 that can perform a baseband downgrade from the iPad's 06.15 baseband to 05.13 on the iPhone 3GS and iPhone 3G. The 06.15 baseband was used by many users to unlock their device. Now it is possible to to get back true GPS and an ultrasn0w unlock. You can download RedSn0w 0.9.14b1 here. 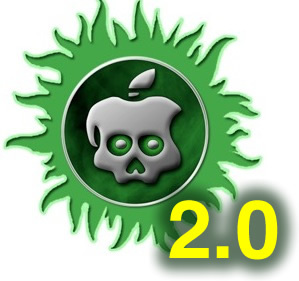 Xvolks has posted a video demonstrating the iOS 5.1.1 untethered jailbreak using the new yet unreleased utility Absinthe 2.0.
iPhone Dev Team have just released a new version of RedSn0w 0.9.10b4. It includes a fixes for iBooks and launchctl. As always, you can simply run the new redns0w over your current jailbreak, just make sure to uncheck Cydia. To fix iBooks and launchctl errors you can also simply install new version of Corona from Cydia. 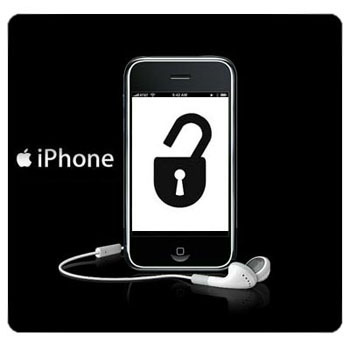 Untethered jailbreak is available for iOS 5.0.1 firmware on iPhone3GS, iPhone4, iPhone4-CDMA, iPad1, iPod touch 3G, iPod touch 4G. 2. If you are not on 5.0.1 yet, update now! If you unlock via ultrasn0w or gevey, make sure you update to 5.0.1 via a custom IPSW! See our guides for sn0wbreeze here. Once you're at 5.0.1, use the latest redsn0w 0.9.10 to both jailbreak and untether. You can download RedSn0w 0.9.10b1 here. UPDATE: ultrasn0w for iOS 5.0.1 released. 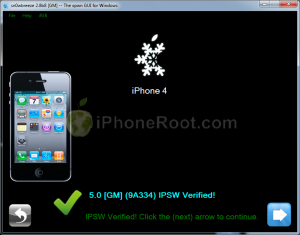 This tutorial is for those users of locked iPhone 3GS and iPhone 4, who updated to iOS 5.0.1 and realized that ultrasn0w unlock doesn't work there. Indeed DevTeam have not updated software unlock utility ultrasn0w to work with the latest iOS 5.0.1. There are two workarounds, that will make ultrasn0w work on 5.0.1. Right after the announcement earlier today that DevTeam has successfully made first steps towards iPhone 4S jailbreak, here is more news. This is just a first step, and as MuscleNerd said there's a lot of work left to do. So don't expect to see new utility anytime soon. But this is still great news. We've released version 0.9.9b6 of redsn0w, with both a functional fix and cosmetic fix for iOS5 jailbreakers. For iPhone3GS owners with the 06.15 baseband, this redsn0w eliminates the network crash you saw when using Location Services in iOS5 (in fact, you don't even need to disable Location Services anymore during the initial setup). The cosmetic fix is to the visual countdown you see when going into DFU mode. It's okay to re-run this redsn0w over an existing device jailbroken at iOS5. 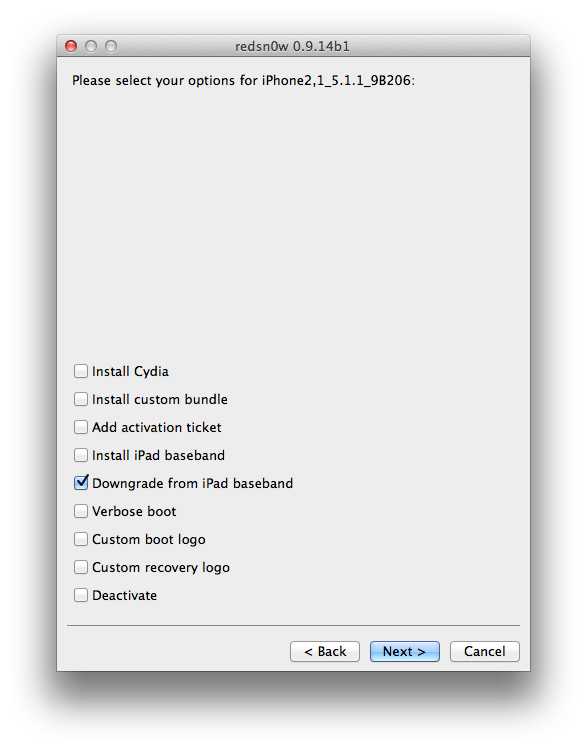 Just choose "Jailbreak" again and de-select Cydia (in other words, all the checkboxes will be unchecked). If you are lucky enough to have an old-bootrom iPhone3GS, please pre-select the IPSW first (redsn0w can't yet auto-detect the FW version of your old-bootrom 3GS if it's already been jailbroken). Just as redsnow 0.9.9b5 the new version supports creating custom firmwares with preserving baseband (modem) version for unlock. Unfortunately right now custom firmware functionality works only with Mac version. You can download the latest RedSn0w version here. UPDATE: RedSn0w 0.9.9b7 released. Minor change, it has an option for a faster jailbreak. Get it here. 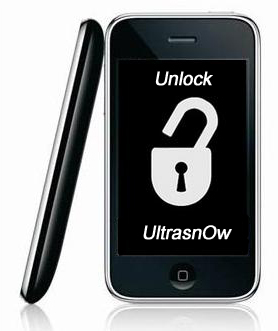 The iPhone Dev-Team has released an update to their UltraSn0w unlock bringing support for iOS 5. Remember that NO new basebands are supported in this release. It only adds support for iOS 5 with old basebands. 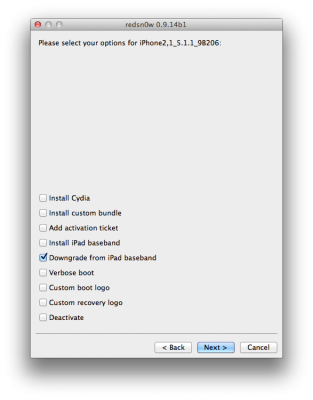 If have one of the above baseband version and need unlock you can upgrade to iOS 5 without updating your baseband using RedSn0w 0.9.9b5 or Sn0wBreeze 2.8b8. Ultrasn0w 1.2.4 is available in Cydia.